As a dietitian I’m well aware that the biggest barrier to healthy eating is time. You don’t need me to tell you to eat your veggies! So here’s my work smarter, not longer tip for you my friend. Make extra roasted veggies for a head start on another meal. Check out the notes below for 4 ways to work leftovers into lunches. And if you have a few extra carrots hanging around and need ideas to use them up (aren’t we all looking for ways to curb food waste) check out my Carrots 4 Ways video. Dietitian's Tip: You'll absorb more of the beta-carotene from the carrots (our body converts that into vitamin A) with a little fat so no need to skip out on the canola oil in this recipe. *Kids Cook: Your child can wash and peel the beets. In bowl, add 1 lb beets, peeled and cut into ½-inch wedges with 1 lb carrots (about 6-8 medium carrots) if carrots are thick cut in half lengthwise, otherwise leave whole and toss with 2 tbsp canola oil, 3 sprigs of fresh rosemary (or 1 tsp dried rosemary) and ½ tsp EACH coarse salt and pepper. Tip: the needles from the rosemary sprigs will fall off so no need to chop. 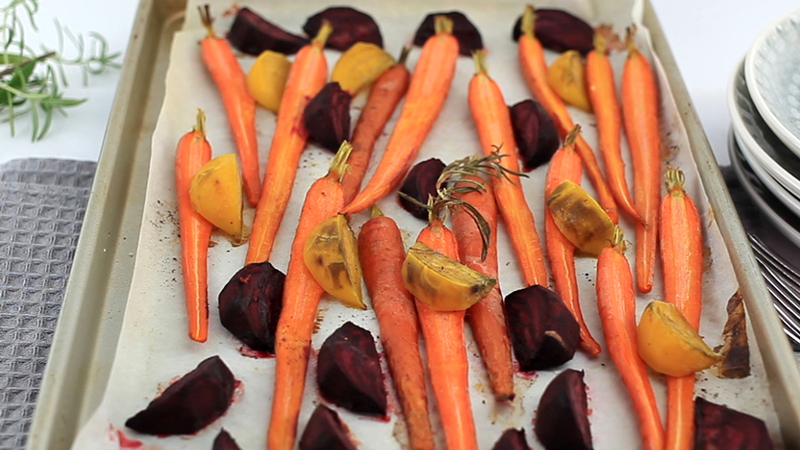 Spread beets and carrots on large rimmed parchment lined baking sheet. Roast in 400°F oven, stirring occasionally, until vegetables are tender, about 40 minutes. 2. Add cold roasted carrots to your child’s lunchbox. Serve with a herby Greek yogurt dip. slices, toasted pumpkin seeds and your favourite vinaigrette. • Use the beet tops in a stir-fry. Use the carrot tops like parsley. • Love kale chips? Use the beet tops (greens) to make beet chips.